the grape-tasters as if they have caught a robbery in progress. sight of a display of table grapes. revelation, bursting with a honey-like sweetness and the intense flavor of… grapes? I guess I never knew. related to that dark purple, moustache-making sugary kid’s drink. that no one has found them yet. a palate cleansing sorbet. Or perhaps in Bea’s lovely clafoutis recipe at La Tartine Gourmande? Maybe on Saturday I can find out. I’ll have to try this–if I can find the right grapes (I’m a grape tester myself). It sounds unbelievably refreshing. I’m an admitted grape taster myself. It does always feel a bit scandalous, doesn’t it? Christine, i totally agree with you on the ‘taste first’ front. Like you, i often go home with a huge bunch and end up not eating them. But i only ‘taste first’ when i’m not with my ‘law-abiding’ fiance. As i always get told off by him. hehe. I would never have thought to pull out the juicer to use those waning grapes–you’re a genius! And it sound delicious. Hhmmmm…where is that juicer anyway? Hey Lisa, Charmaine and Mae — glad to know I am not the only grape taster out there. There is all kinds of Indiana wine, Lisa, though not all made with Indiana grapes. There’s even an Indiana Wine Trail. Not sure much of it is worth sampling, although the local winery down the road from our house (Oliver Winery) actually does a decent ice wine. It’s especially tricky now here because they package grapes in those new plastic bags with the slits cut in them for ventilation. I have learned to extract a grape through the slits without ripping the bag, but I get some *very* weird looks. Kevin, that’s the downside of having a cool and unusual kitchen with lots of storage space. I am sure that juicer is there somewhere…. Are these photos on your site taken by you? This grape-shot (and all of them really) is/are spectaular. 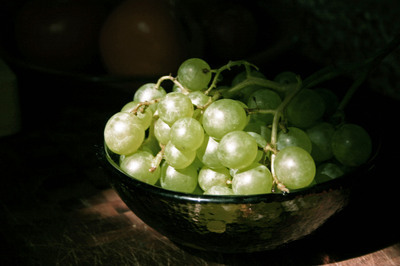 I like grapes without seeds. And it seems like I’ve had some tiny little grapes that tasted good… like a miniature cluster of grapes. Tiny magenta/violet grapes. One has to eat A BUNCH of these. Like small “flavor pills.” Not much food there but a “whole-lotta-bang.” Any idea what those were? Yep, I take ’em. I am pretty new at this so I just shoot a whole lot, thank God for digital cameras and Photoshop, and sometimes I get a good picture out of the deal. I thought the grape one was nice too — thanks to a serendipitous appearance of the sun just as I was shooting. Wish I knew how to do that on purpose. I think those must be champagne grapes you had. Clusters of little eensy beensy grapes — you are right that they take a lot of eating. I have just discovered your site, and am happy I did. Your photographs and writing are wonderful. I am hoping your Zoe is still hanging in there and eating pizza crusts. I have 3 dogs, and know very well how their short, beautiful life goes by in a flash. Much too fast. The grape photograph is amazing. Looks like a Dutch stillife. Thanks for your very kind words. I am glad you came by. Zoë is still with us, unbelievably, rallying a bit on the very day I called the vet to make an appt. to let her go. Haven’t tried her on pizza crusts, but she is eating chicken and pasta with pesto Genovese. Go figure. Hope to see you here again. Your eating grapes in the supermarket reminds me of my dad. I grew up in Florida where we had wonderful fruit stands. Before you bought anything you were always given a slice or a taste of the fruit. Because of the fruit stand culture everyone tasted fruit in the grocery stores as well. How else would you know if it meet your expectations. When I visit Florida now most of the favored fruit stands are gone and not everyone tastes the fruit in the markets. I am glad you still do. I know my dad would too.